Lacy Scarmana is less than a year into her first full-time job in public radio and she already has a hit podcast. Scarmana hosts Suspect Convictions, a podcast out of WVIK in Rock Island, Ill., that shot up to number two on the iTunes podcast charts last week and has more than 600,000 downloads. WVIK released five episodes early this month. The podcast examines the 27-year old murder case of Jennifer Lewis, a 9-year-old girl from Rock Island who was found burned to death in 1990 in nearby Davenport, Iowa. The man who has been twice convicted of the crime, Stanley Liggins, now faces his third trial in the case. His earlier convictions have been overturned on appeal. Scott Reeder, a journalist who was one of the first reporters at the crime scene in 1990, partnered with WVIK to create the podcast. He is writing a book about the case that is to be published in 2018. “I’m really surprised and overwhelmed by how many people have been listening to it,” said Scarmana, who suddenly finds herself fronting her first big show. Up to now her jobs have been behind-the-scenes roles in digital curation or as an intern. “There’s a very large fan base for true crime stories that I was completely unaware of, so I think the subject matter in general drew in a lot of people,” she said. Re-examining the case is important beyond the forthcoming court proceedings, Reeder said in a press release. Unlike other widely-reported crimes involving children, such as the kidnapping of Elizabeth Smart and the murder of JonBenét Ramsey, Lewis’s murder occurred in very different circumstances. Her family was poor, and she “grew up in very tragic circumstances,” he said. Her case shouldn’t be overlooked just because of her economic status. “I think it’s important that his case be looked at carefully,” he said. Suspect Convictions goes into detail about the lives of Lewis and Liggins, who is now in his 50s. Preliminary hearings in for third trial are set to begin in early February. The podcast incorporates much of Reeder’s research, including audio he recorded during interviews for the book, and additional reporting from WVIK. The station expects to produce up to 20 additional episodes as news developments warrant. WVIK is also broadcasting episodes of Suspect Convictions on Friday evenings. Scarmana, who graduated from Indiana University in 2015 and interned at Chicago’s WBEZ, signed on as WVIK’s digital curator last year. 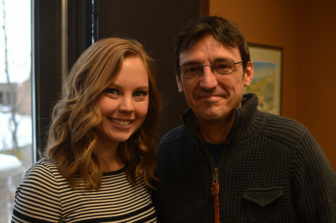 After Reeder approached WVIK last fall about his book on about the case, she started working on the podcast with Alfredo Manteca, an intern who is production assistant on the show. Stations can keep their costs down and produce quality content if they find good partners to work with, Pearce said. He intends to look for other partners in the community to create additional podcasts, especially on local subjects that could interest listeners outside of Northwest Illinois. Pearce doesn’t expect to earn lots of revenue from the Suspect Convictions. Under the station’s agreement with Reeder, it only has rights to sell local sponsorships for the show. Still, he says the exposure for WVIK on iTunes has been an unexpected benefit. The podcast, which features the hosts of “Morning Edition” and NPR reporters, launches Wednesday. Good idea. We want this programme on most NPR stations.